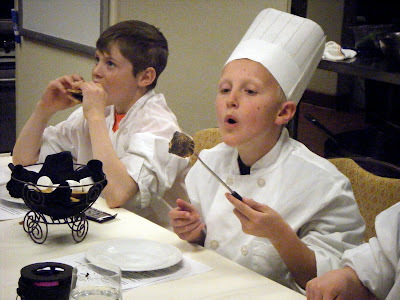 When the top toques at Suncadia decided to revamp the children’s menu at their signature restaurant, Portals, they called in the troops — and used fresh ingredients and recipes that would appeal to the 10-and-under set. In their search for hungry kidlets they didn’t have to look far. A clutch of tikes from Cle Elum and other points east showed up on a recent Saturday to weigh-in on whether or not this family-friendly resort’s stuff was up to snuff. On top of spaghettiiiiiii, all covered with cheese. 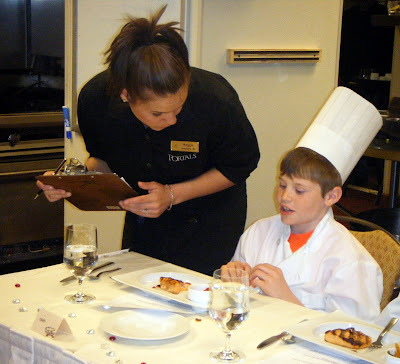 . .
Nate went too, since, as he always says, “Everyone’s a critic, but only some of us get paid for it.” He was duly impressed by the parade of non-stop courses, starting with a baseball-sized meatball infused with vegetable puree and ending with (count ’em!) two desserts. 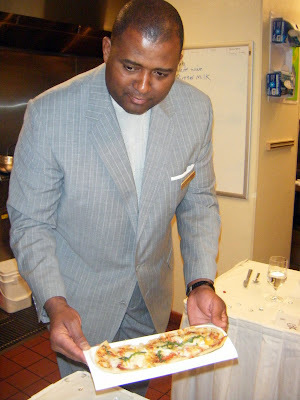 Having had a long history of over-eating at some of the best restaurants in and around Greater Seattle, he was well-suited to the task. 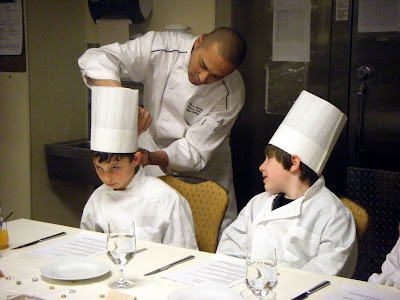 Nate (right), watches as chef-exec Andrew Wilson fits crown prince Jordan, 10. 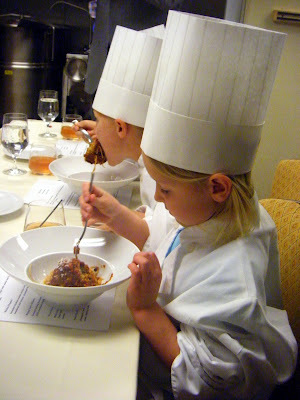 Suncadia’s chef-exec, Andrew Wilson, knows a thing or three about kids: he’s got little ones himself. 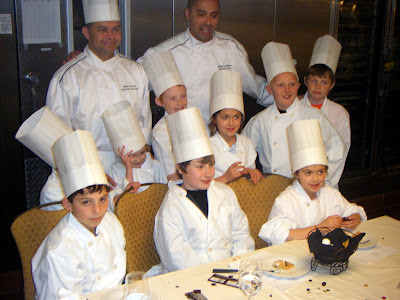 As does executive sous-chef Oscar Guitron — known in these parts as “Maria’s daddy.” So says one kiddie-degustation participant who, as a friend of Maria’s, spoke from experience when she told me Guitron makes some mean green eggs and ham. “Maria’s daddy” ringing in another course. 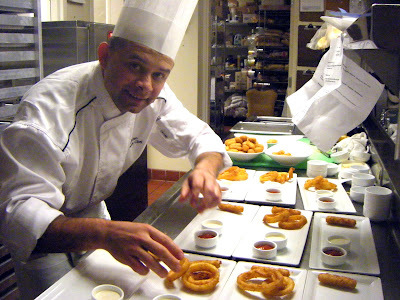 Oscar’s no wiener, and 7-year-old Natali (whose favorite restaurant was heretofore Perkin’s Pancake House) gave top honors to the onion rings that came alongside his hand-dipped mini-corndogs. These were served with mozzarella sticks and a duo of sauces (marinara and ranch dressing). Natali’s twin Naomi liked them too. Twice is nice when it comes to those onion rings. Karver, 8, gave two thumbs up to “Sloppy Tom’s Sliders” — made with ground turkey braised with tomatoes, but said the corndogs were great, too. Karver and his sister Avalon, 5, get Sloppy. 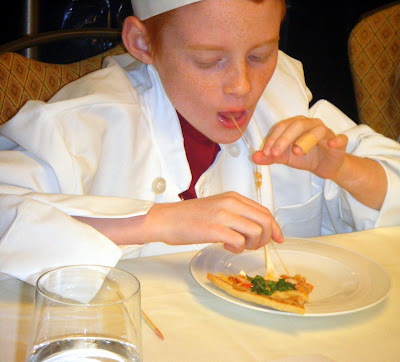 Jack, 10, was less impressed with his Sloppy Tom, and complained, “It needs more Sloppy.” (See? What did Nate say? Everyone’s a critic). 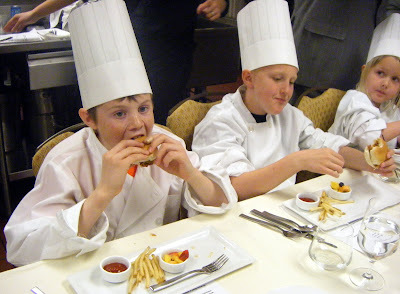 Carson (left, 10), Jack and Lydia (5) chow down. 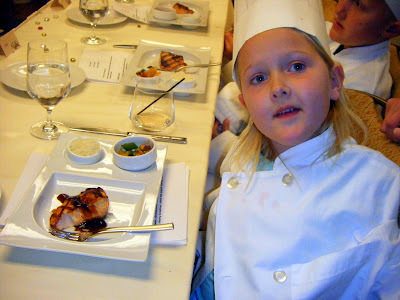 Lydia enjoyed the sweet soy-glazed king salmon served with rice and veggies (my choice for “best of show”), though when it comes to salmon, her preference, she says, is smoked. Princess Lydia bows to the king. Karver’s favorite course was the “Sticky Fingers” — breaded chicken breast with barbecue sauce (there’s zucchini in that batter? no way!). On the side: mac ‘n cheese plus steamed broccoli. 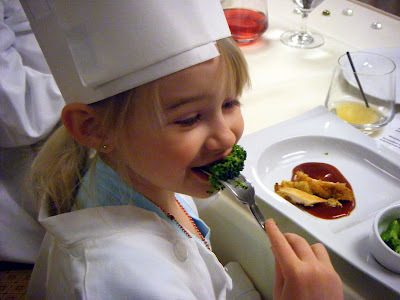 His sister “Av” (as he calls her) warmed the cockles of my heart with her outbursts of glee — and her taste for fresh broccoli. Fresh fruits and vegetables are, after all, an integral part of a well-balanced diet. It also helps if they’re colorful and cute. 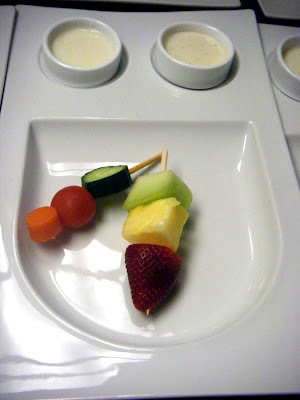 Fruit and veggie crudite-kebabs smile for the camera. By the time the four-cheese flatbread came around, most of the kids were full-up. 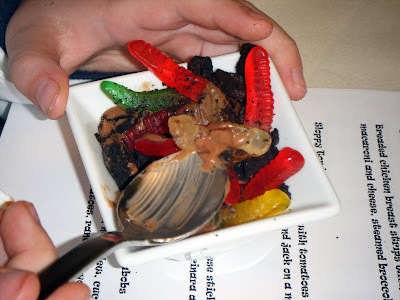 Gummy Worms squirm in the dirt (Oreo cookie crumbs) with chocolate pudding. 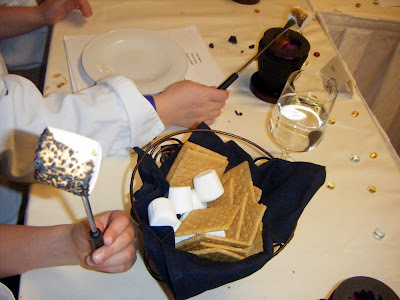 But the piece de resistance were the DIY S’mores — an event you don’t see every day at a white-linen restaurant (er, kitchen). Even Jack rallied for that one. When the party was over, the toques (large and small, salaried and non-) posed for a parting shot. “86 those tikes! We’ve got a catering for 200 in an hour! 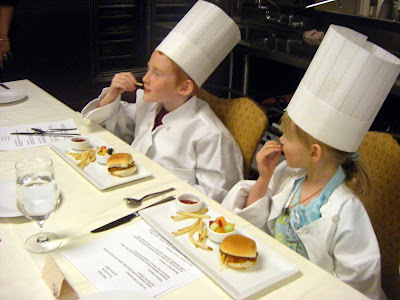 As the chefs at Suncadia know (and I’m here to back them up), the best way to get a kid interested in good food is to feed them right and spend time with them in the kitchen. 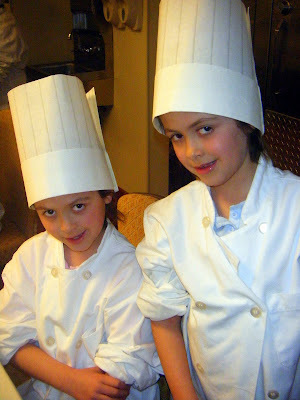 Wilson and Guitron did just that on our visit, and have since put together a “Little Tikes” menu for their fine-dining restaurant using the same products the grownups eat. The menu ($6-$10) makes its debut June 19, just in time for the summer season. And you don’t have to be a hotel guest to partake. That was my first trip over the mountains to the Cle Elum Valley and Suncadia — a 90-minute drive from Seattle. Fun? You bet. And while kids will be kids (Nate nearly cried when we had to leave the 6,400-acre resort without going biking, fishing, horseback riding or geo-caching), they grow up too soon. When they do, who knows? 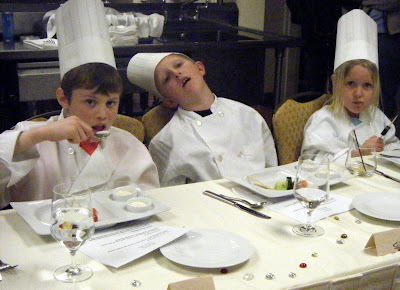 Several hours in a professional kitchen may have changed their minds about becoming firemen or ballerinas (or, in Nate’s case, a marine biologist). One day you’re a tike in a toque, and the next thing you know you’re running the show!